Plymouth Barred Rock hens walk around the yard at the home of Courtney O’Shea in Lathrup Village on Thursday July 6, 2017. Some people view their backyard chickens as pets — but they shouldn’t snuggle or kiss them. That advice comes from the U.S. Centers for Disease Control and Prevention, which is cautioning the public about a multi-state salmonella outbreak — including in Michigan — related to live poultry. Though the CDC has put out similar warnings in recent years, officials say the number of illnesses and salmonella outbreaks linked to live poultry is increasing amid changes in the farming industry and as more people keep birds in their backyards. Backyard chicken owners counter that the hobby is a safe, fun and educational way to provide food for their families. They also say the CDC’s safety guidelines are just basic commonsense. There have been 18 cases of salmonella illness in Michigan linked to live poultry from the Jan. 1 through July 7, according to the CDC, out of 790 cases nationally. The cases are part of 10 outbreaks in 48 states. The CDC defines an outbreak as when two or more people get sick from a common source or exposure. Salmonella bacteria live in human and animal digestive tracts and are shed through feces. The bacteria causes fever, severe diarrhea and abdominal cramps. Most people recover from an infection in a few days without treatment. In rare cases, complications can lead to death. Nichols said changes in farming industry practices are part of the reason salmonella outbreaks linked to live poultry are on the rise. Individuals and feed stores are able to purchase chicks online through large, mail-order hatcheries, she said. Chicks are often housed and shipped in large numbers, stressful conditions that can lead them to shed salmonella in higher numbers. Some feed stores keep chicks in large bins that are accessible to the public. “The way these chicks are produced and then sold has changed significantly, which is I think why we now see these large multi-state outbreaks that spread across the country rather than small, local outbreaks,” Nichols said. She said the CDC began to more thoroughly investigate outbreaks in 2009. That’s also when the agency began picking up on large, multi-state outbreaks. Officials often see an association with illnesses and people who recently purchased their birds. “These aren’t necessarily the birds that have been in the back yards for years and years,” Nichols said. “These multi-state outbreaks are often birds that just came into the home, that are stressed and they’re shedding salmonella. Some backyard chicken owners see the CDC’s warnings as alarmist. Mikulski, 36, said the number of illnesses is a fraction of the overall chicken population. A forum on the website backyardchickens.com has more than 331,000 members. Mikulski runs the website FerndaleChickens.com and the Facebook page Ferndale Backyard Chickens. The CDC urges people to wash their hands after handling chickens and not to allow them in their homes. Those who are younger than 5 or older than 65 or have weakened immune systems should not handle live poultry. People should not drink or eat in the area where the birds are kept, the CDC says. And kissing live poultry is a definite no-no. Several metro Detroit communities allow backyard chickens, including Lathrup Village, Ferndale, Madison Heights and Royal Oak. In Berkley, the City Council voted to allow backyard coops during a one-year pilot program that began this month. Like in other cities, there are a number of rules. Up to five permits will be issued. There’s a three-hen limit. And coops are subject to two inspections a year by building and code officials. The biggest concern from residents who were opposed was that the chickens would bring rats, Berkley City Manager Matt Baumgarten said. Council members visited backyard coops in other cities before voting to allow them in Berkley. “They wanted to see that my chickens were safe, healthy, not loud,” said Courtney O’Shea, 47, of Lathrup Village, who invited council members and other Berkley residents to check out her coop. “For everyone that came to my coop dead set against it, no one left dead set against it. Mikulski started keeping chickens in 2012 because she was interested in having a closer connection to her food. Her three backyard hens — Bossy, Dumptruck and Crow — have distinct personalities. 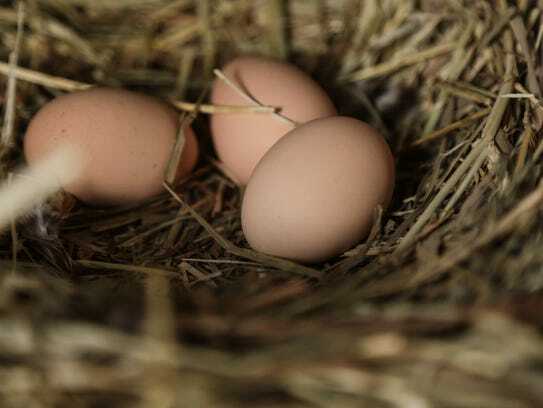 Each bird lays about one egg per day. O’Shea likes having a hobby she can share with her children, Aiden, 14, and Quinn, 11. “As with holding reptiles or raw meat, you have to wash your hands,” she said. “The issue to me is about hygiene. … rather than blaming it on the chickens. You can get salmonella from a variety of sources.